WASHINGTON, D.C. — There’s a new federal plan to keep states from taking away people's professional licenses just because they fall behind on student loans. 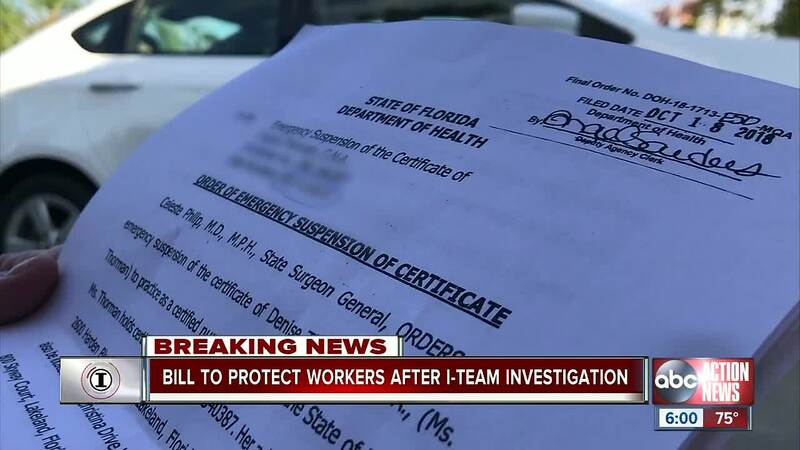 We reported last month how the Florida Board of Health sent notices to more than 900 healthcare workers telling them to repay their student loans or have their licenses suspended. They received the notices from the U.S. Department of Education, which is trying to reduce the number of defaults on student loans. At the time, we spoke to former certified nursing assistant Denise Thorman, who said she was heart-broken when she had to surrender her license last year — all because she couldn't pay her student loans. “Your license is gone, your livelihood's gone, the care of your patients is gone. How fair is that?” she said. U.S. Senators Marco Rubio and Elizabeth Warren don't think it's fair at all. They have now introduced a bill that would prevent states from suspending, revoking or denying professional licenses as punishment for falling behind on student loan payments. Senator Rubio says the new law would prevent states from threatening worker's livelihoods by trapping them in what he calls a "modern-day debtors prison." Currently, 13 states have the power to take away health care licenses for unpaid student loans, but the I-Team found Florida is only state currently actively suspending licenses — 97 at last count. If the law is passed, states would have two years to comply.